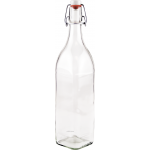 1l myRex4you 4 sided juice bottle with Grolsch style closure. These bottles are great. I've ordered multiple sets, both for myself and for gifts, and am very pleased. The glass is thick, I manage to drop/bang them around quite a bit while doing dishes and haven't lost one yet, and they also look beautiful filled with juices in my fridge.I honestly can't believe how pleased I am about a bunch of glass bottles, but here I am and I'm giving an enthusiastic recommendation to anyone who didn't realize that they needed a bunch of glass bottles in their lives. Very well done. Not a lot you can say about a bottle, but, these are the best. Bottle is the bottle, but the cap is very well made and will last your lifetime. Thank you so much for turning out something that will last. I got these bottles because my kids kept reusing old plastic and soda bottles and they would get moldy lids and a slime substance inside. Now that I have these, we all have our own water bottles to use and carry with us. The lids are watertight and super easy to clean as well as the bottles. This multi pack is awesome because it comes with 6 bottles and they come with a handy brush to easily clean the inside. They are very durable and a great size, I like that you can put juice and other liquids besides just water. That is one gripe I always had with plastic bottles even BPA free because if you use juice or other beverages it stains the bottle and sometimes leaves a smell inside. NOT with these bottles! The bottles come in a very sturdy box with cardboard separating each bottle so there is no worry of the bottles being damaged during shipment. I would recommend these 100% to anyone looking for a environmentally friendly, reusable and BPA free container for water, juice and other liquids. Absolutely what I was looking for. Thanks to all the reviewers that convinced me to try this item. The seller emailed me to tell me how to wash the bottles! The two boxes came in, washed them and filled them with filtered water, bye bye plastic! The brush that comes with them works perfectly, but I won't be needing it often as I only put water in there. And if I could describe them so, I would say they look elegant in my fridge! They are wonderful. No more buying plastic water bottles for me! I keep all 6 of them filled with water in my fridge so I have access to cold water all the time. And it's much more environmentally friendly way of having water on the go. They look great! The lids are super nice, and I've had zero issues with them. They actually help me drink more water because I have cold clean water in my fridge all the time now! LOVE LOVE these bottles! I do a lot of juicing and these are perfect for storing my juice. I can feel the bottles all the way up and once I put the caps on them, I don't think any air can get to the juice which is what you need when juicing. If you don't have the sleeves that go with them, I'd consider buying them too. They are great and keep the juice cooler longer. Bottles were a great investment for me and they store easily in the refrigerator. These are nice bottles. Solid design with internal stainless steel. I made some tea using my Keurig and placed it inside these bottles while the tea was still fairly hot. The bottles didn't break. I did let the tea cool to room temp in the bottles before putting them inside the refrigerator.I am a bit worried about breaking these so I have been searching for silicone sleeves that will fit them. Once I figure out what ones might fit best, I will update on whether it was worth the additional investment. Also thinking of buying some etching cream to do some personalizing on these bottles.All in all I am quite satisfied and am glad I ordered these. I've only used these about a week, but already love! I use them to store juices I make, and for the 2nd ferment of kefir water. I'll be buying a second set now that I know they are very, very good quality.Update: Bought a second set. They wash beautifully and are still very air-tight after multiple trips through our dishwasher. I absolutely love their performance!